Today we're popping in to share how mambi Social Media Coordinator Amanda Rose Zampelli (blog | IG) used a few pages from the new Rose Gold Horizontal Happy Planner™ to document her recent road trip vacation down to Florida with her boyfriend to see her Grandma. "I decided to use pages with the horizontal layout because I wanted to switch it up a bit. The fact that I was on vacation from my usual routine made it make sense to memory keep my vacation in a way that was different from my usual routine of the vertical layout. It was also fun to play around with photo dimensions and crops, making bigger moments from vacation larger, like my deep pool dive and the car convo between my boyfriend and Grandma." "I layed down the photos first - corresponding them to the day in which they happened (the beauty of memory keeping in a planner). 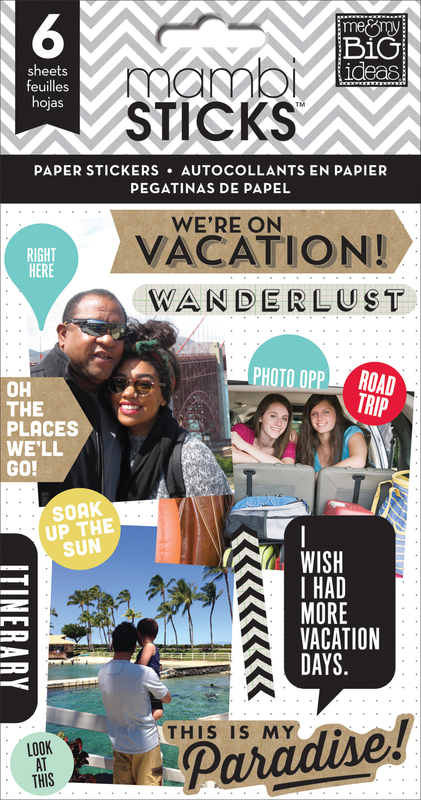 Then, I flipped through my vacation/travel-themed mambiSTICKS stickers and layered them on top of my photos. In whatever blank space I had left, I journalled or bulleted about that day. I chose turquoise, green, and blue pens to match the color combo the photos naturally created." "To conclude these vacation pages, I stuck down a photo of a couple of breezy palm trees and an 'I WISH I HAD MORE VACATION DAYS' sticker. It couldn't have been more true." Shop supplies Amanda used by clicking on the items below. Today we're sharing a planning spread in the 'Be Bright' Happy Planner™ of mambi Design Team member Jennie McGarvey. This spread is from the first week of July, but is great inspiration for how you could decorate a week to cheer on your favorite Olympic team! "Hooray! When I finally got to move into my 'Be Bright' Happy Planner™ for real I was thrilled! I LOVE this design. ...and the first week? A vacation week! So, I wasn't even able to use it to it's full planning potential." "No matter...I still found a way to be thrilled with my introductory week. 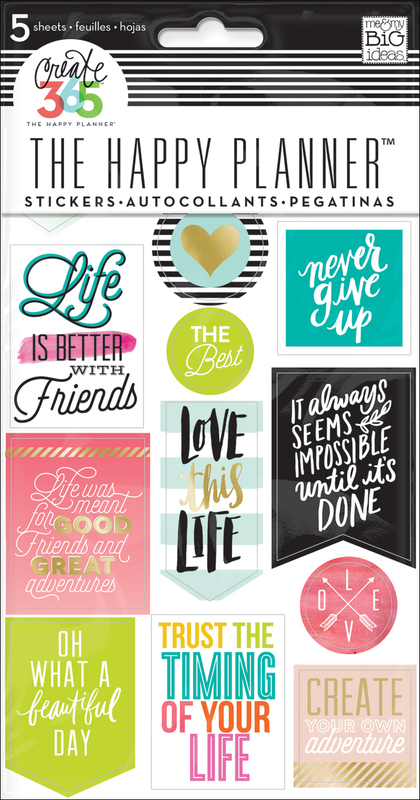 Enter the me & my BIG ideas alphabet mambiSTICKS stickers and the new Happy Planner™ 1000+ sticker value packs. I created a week that sets the stage for the next 18 months." Check out Jennie's 'Plan With Me' YouTube video on these pages below. Okay, it's July 18th, and we know: Summer should get a speeding ticket, but there's still time to fit in all the activities you have on your Summer Bucket List. Today we're sharing how mambi Social Media Coordinator Amanda Zampelli (blog | IG) used the 'Summer Bucket List' page of the 'Seasonal' 1000+ sticker value pack to fill out the free printable she downloaded at the beginning of the month. "I printed out two of the free download pages containing the 'Summer Bucket List' so I could make my list double-sided. I filled out the list before I stuck them together to make sure the stickers were balanced. I had to cut a few of them so that they would fit in the Bucket List boxes, but the end result came out cute! 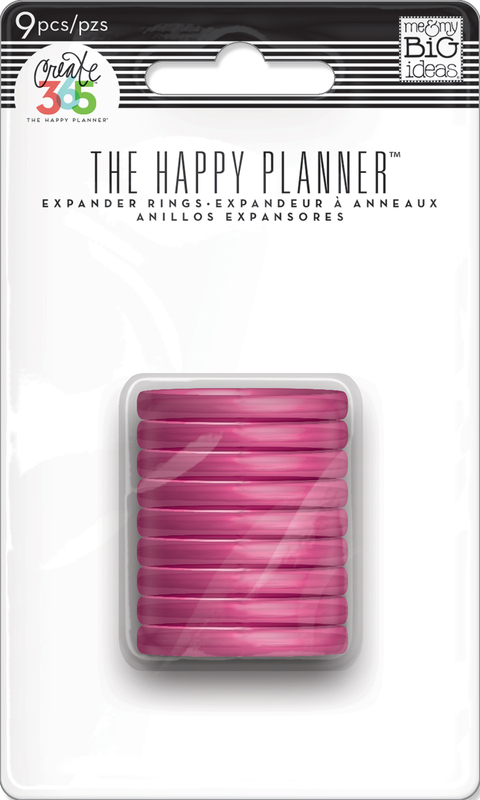 NOTE: I used the larger list (meant for the columns of The BIG Happy Planner™) with a snap-in tab so it ran the length of the CLASSIC size when inserted." 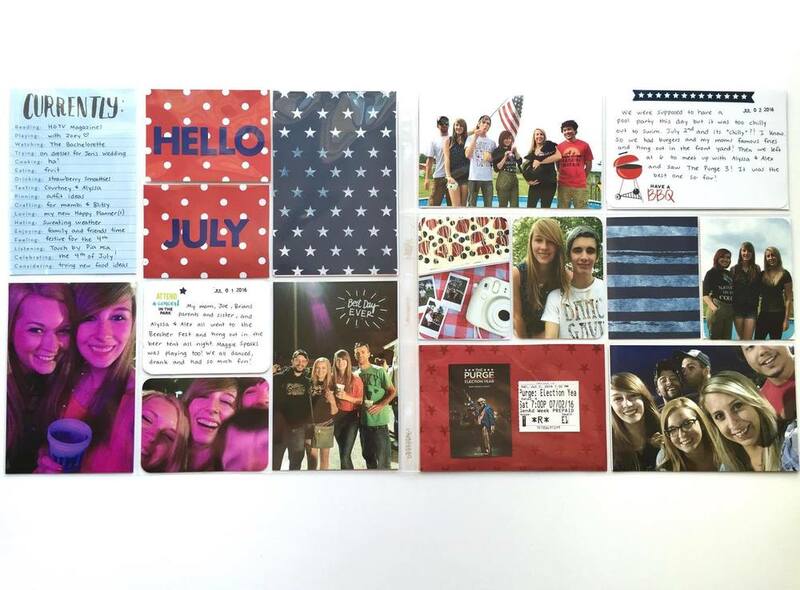 Memory keeping in POCKET PAGES™ still has a special place in our hearts, and today we're sharing how mambi Design Team member Megan McKenna documented her 4th of July weekend using traditional 12x12 page protectors. 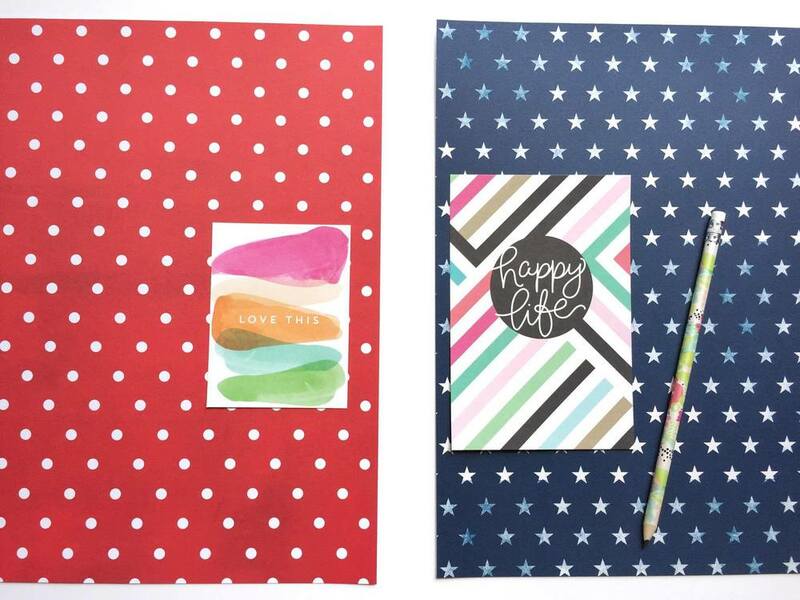 Megan made DIY patriotic-patterned pocket cards by cutting papers from our 'Americana' mambiSHEETS paper pad, and summer-themed pocket cards from our new 'Seasonal' Happy Planner™ sticker value pack! "The 4th of July weekend has come and gone. Now it's time to put those memories into my 2016 album! I absolutely LOVE the 'Seasonal' Value Pack sticker book! I love that there are 'Bucket List' stickers, but for me, I don't think I would want to use those cute 'have a BBQ' stickers in my planner. I know many people that memory keep in a separate planner but I would rather have my memories in an album with full-sized photos." "I decided to take those stickers and made my own pocket cards with them! I traced an already cut pocket card over some scrapbooking paper from the 'Americana' mambiSHEETS paper pad and made my own filler cards! This paper pack is perfect for crafting up anything 'MERICA!" "Once I cut out a few cards, I cut out my cards from plain white card stock, where the cute 'Bucket List' stickers are going. Then I started putting it all together!" "I came up with a plan to document the 'currently list' every month in my planner, and then transfer that info onto a pocket card to put in my album." "Now I have five pages documenting my 4th of July weekend using entirely all mambi products! I have my own pocket cards from scrapbook paper, I used the 'Summer Bucket List' stickers DIY journaling cards, and my photos have fun stickers on them! I plan to experiment with other scrapbook papers to make more journaling cards for upcoming events! 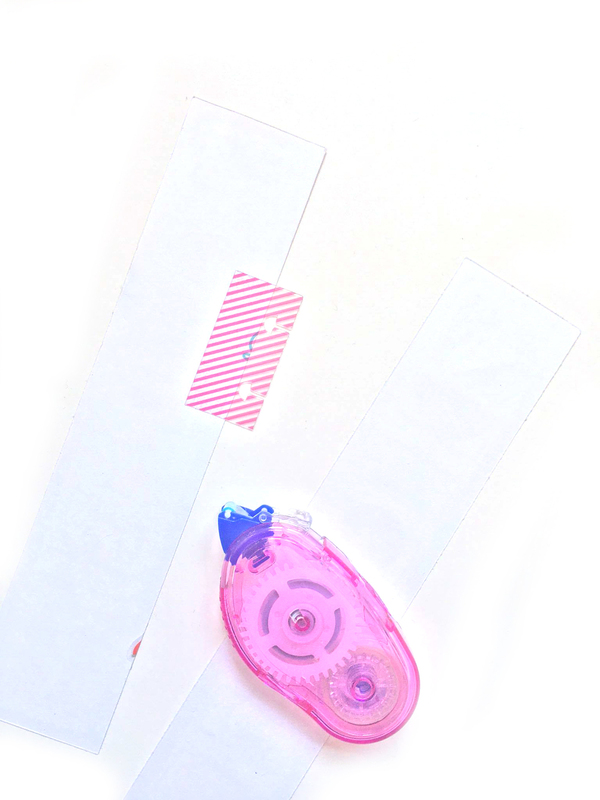 It's such a simple way to do it and me & my BIG ideas has SUCH adorable paper, so why not?!" 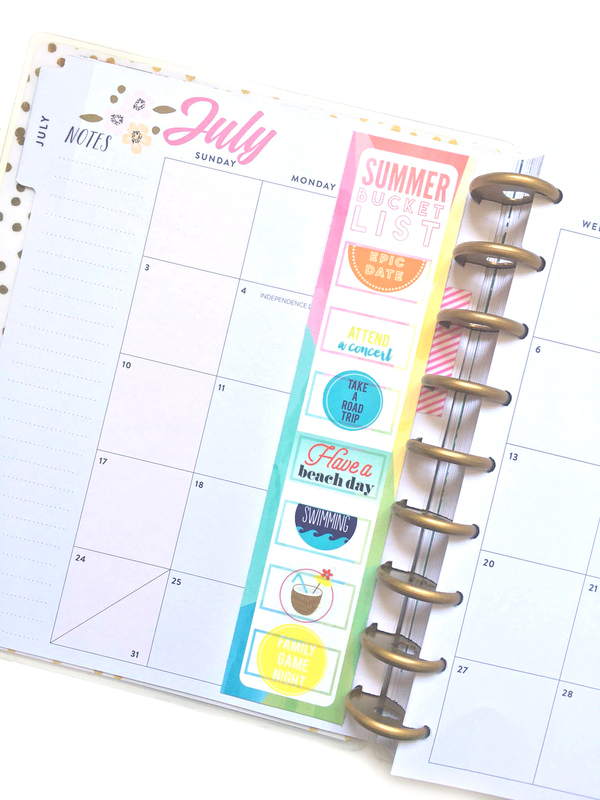 summertime in The Happy Planner™ w/ new products! 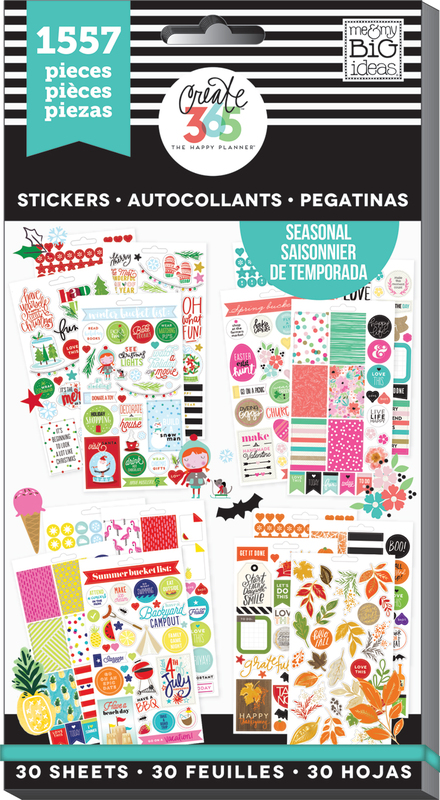 We are in the thick of Summer, and thanks to out new 'Seasonal' 1000+ sticker value pack, its easy to 'summer up' your monthly and weekly spreads! Today we're sharing the bright and summery first week in the 'Picture Quote' Happy Planner™ of mambi Design Team member Heather Adams (blog | IG). "This was the first time I've played with the new products and those huge booklets of 1000+ stickers are AMAZING! I want to make everything with those things!" "For this spread, I wanted everything to SCREAM 'summer.' So, I began by picking out some brightly patterned sticker blocks to fill in a few of the weekly columns on my spread. Next I added some little phrase stickers and tasks throughout the week. I embellished my spread with some fruit stickers (hello, adorable pineapple!) and a black ribbon paper clip to mark my page. 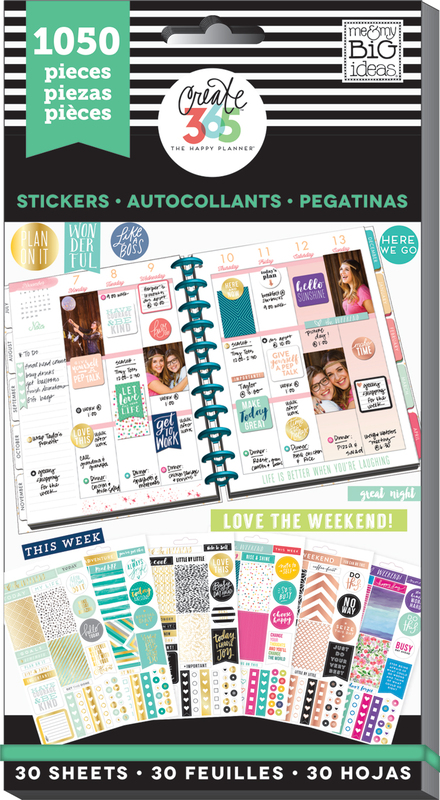 There's just something about all these bright, fun, new products that made the week seem so much more exciting!" We're glad mambi Design Team member Mary-Ann Maldonado (blog | IG) made it back safely from her week-long camping trip in the woods of Maine because (a) we love her, and (b) this amazing weekly spread in her Happy Planner™ might have been lost forever! Mary-Ann decided to journal her way through her camping week using our new thin-tipped marker pens perfect for planning! "I am happy this morning! We are out of the deep woods of Maine, showering with hot water and sleeping soundly in our own comfy beds! Sleeping in a lean-to (a 3 sided building with a tarp hanging in the front) for 5 nights, bathing in stream from melted snow and being eaten alive by moose flies and skeeters, makes you really appreciate the comforts of home! However, I do believe, Maine is one of the most beautiful places on earth. We saw nature in its most magical form." "For my week in the woods, I decided to journal my way through the week. We really didn't have an agenda, so planning would have been difficult. I documented random thoughts each night and how many different animals we saw. We had a bet on how many of which one we would see. NO ONE guessed we would see four bears! That definitely made sleeping a little more difficult!" We love how Mary-Ann kept to a simple yellow & blue color scheme. That must ave made choosing embellishments a lot easier. Also, in edition to her AWESOME journalling, Mary-Ann included the pages below: a full-page photo she divided into three sections to fit The Happy Planner™ page protector, and a bear drawing with a bible verse on a Happy Planner™ grid paper. Summer days are winding down, and now's a good a time as any to get them in the books. With this POCKET PAGES™ spread, mambi Design Team member Heather Adams has recorded two #AWESOME memories from Summer 2015: family time on the lake and a solo picnic in the park. Not to mention: sequins shaker pocket!!! "I love making pocket pages using mambi's POCKET PAGES™ cards. Today I'm sharing a spread that I made that encompasses two different events/days. The left side is a page about my family having a fun time on the lake on Saturday. I juts HAD to rephrase that card in the bottom left-hand corner to say, 'Life is better at the lake.' Originally the card read, 'Life is better with you.' While I love the original phrase, I thought the new phrase fit the spread perfectly." "The right side of the spread is about me enjoying my lunch in a park one day. My favorite element on this page is the shaker pocket. I simply used my Fuse tool to seal the pocket after I had added the sequins over the "&" card. Don't be afraid to add sequins over you cards -- it adds a perfect interactive element to your page!" Shop the supplies Heather used by clicking on the images below. Hope to see you @meandmybigideas + @the_happy_planner on Instagram! 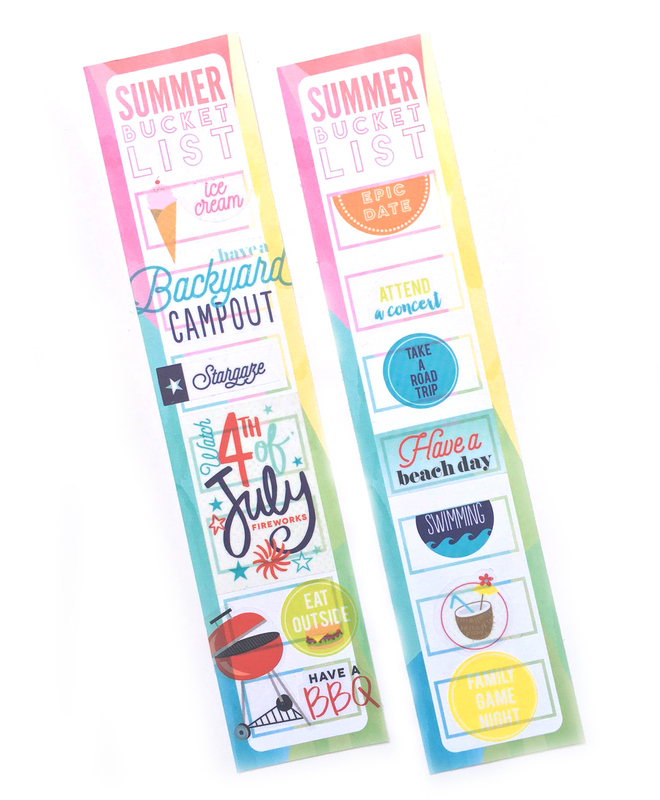 We love how mambi Design Team member April Orr made the bold choice of using these over-sized mambiSTICKS alphas across her Happy Planner™ spread to mark what the last week of summer vacation for her family was all about. "Last week was our last week of summer vacation and the boys and I headed to the Lake. There was not a whole lot "planned" except beaching and being spoiled by my parents." April demonstrates a great photo-less way to document a family vacation, and makes sure she had her family's activities and 'to do's all planned out while still looking pretty. Shop supplies April used by clicking the item below. See you @meandmybigideas + @the_happy_planner on Instagram! We adore how mambi Design Team member April Orr captured a day of Summer bliss with these two POCKET PAGES™. When you break it down, all April did was include two 4x6 inch photos that captured moments from the day, a title card "bliss" cut in half, and a journal card. This project is an example of a POCKET PAGES™ craft that would make a great submission if one were trying out of the Memory Keeping / Paper Crafting area of the mambi Design Team OPEN CALL going on now. If you're crafty, and love me & my BIG ideas products, we encourage you to apply. Have a blissful weekend, friends! Live creatively! 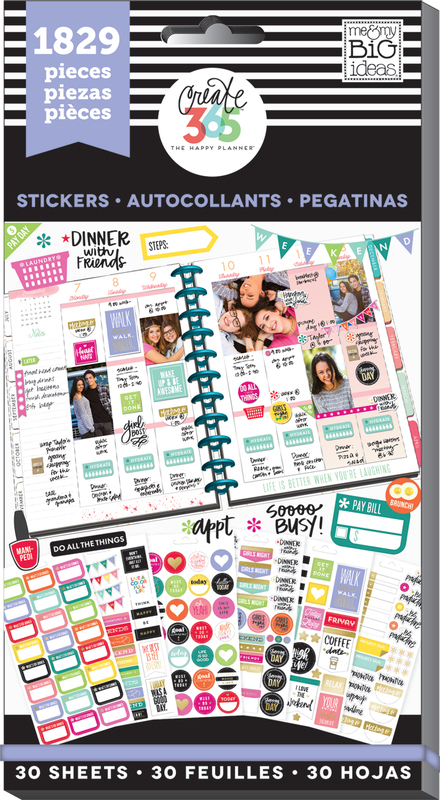 The past few posts have been BACK TO SCHOOL themed, and our Design Team has done a great job showing us ways to use our Happy Planner™ to organize back to school activities. 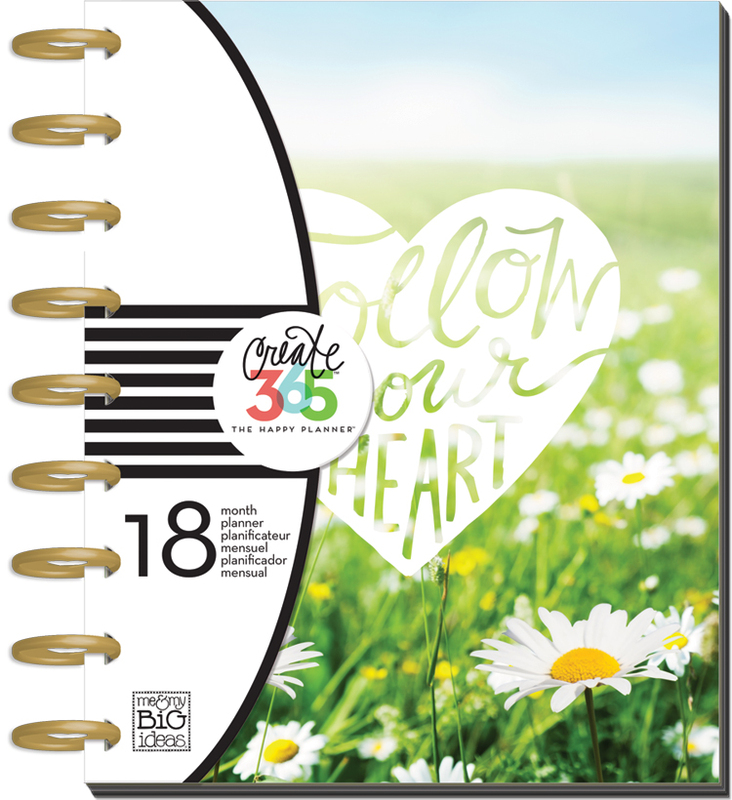 Today, however, we're sharing a different kind of project by mambi Deisgn Team member Theresa Doan...a project that shows how you can use your Happy Planner™ to capture Summer memories, maybe now that they kids are back in school. Now that it's August, we often get the question from potential Happy Planner™ customers if July 2015 will still be included in their purchase. The answer is YES, it will be, and we encourage you to fill it with photos and stories of your summer! Theresa did just that in these pages, and we know in a year (or 2 or 10) she will love looking back and remembering that on Thursday, July 23rd, 2015, her son ate corn like a ninja turtle. What an awesome memory to preserve! Supplies used for the project can be purchased by clicking on the item below. Be sure to follow @meandmybigideas + @the_happy_planner on Instagram! 2015-16 mambi Design team OPEN CALL coming soon.